Gentle Business Mastermind | Do business, gently. guides you through different themes, providing insights, stories and powerful reflective questions to help you assess, gain clarity and take action in your business. By accessing the free guidebook, you’ll also go onto our interest list so we can let you know about the 2020 mastermind. is a 12-month experience beginning in March each year, designed to support you to grow your businesses gently, sustainably and consciously. As a community of like-minded business folk, together we’ll look at our businesses through a different lens, guided by carefully curated monthly themes such as Business Foundations, Offerings, Gentle Money, Conscious Business and more. If you’re an entrepreneur, solopreneur, soulpreneur (and any other variation of this! ), a maker of beautiful things, a creative, a coach, a teacher, a writer, a business person who likes to do things a little differently and is ready for 2019 to be the most successful AND gentle, THIS IS FOR YOU. We offer this as a ‘per business’ mastermind so if you’d like your staff or a couple of your colleagues to join you as well, we’d love to have you! Perhaps you’d like to learn a little more about your hosts between now and 2020? 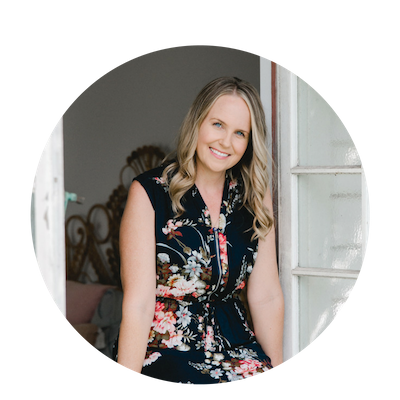 Amanda Rootsey is the founder of teen personal development academy, Shine From Within®, a business coach and mentor, a published Hay House author and a gentle-living advocate. 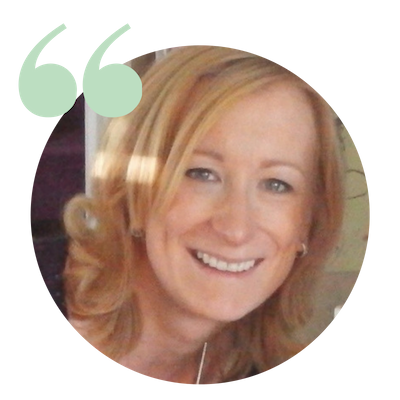 It was the discovery of a lump, and subsequent cancer diagnosis, while living and modelling in Italy in 2009 that kick-started Amanda’s journey to living and working GENTLY. Freedom and peace are now her driving values and she knows wholeheartedly that we can contribute to the world, make money and do it in a way that feels lovely (aka not feel completely drained at the end of the day!). And that’s her hope for you too. 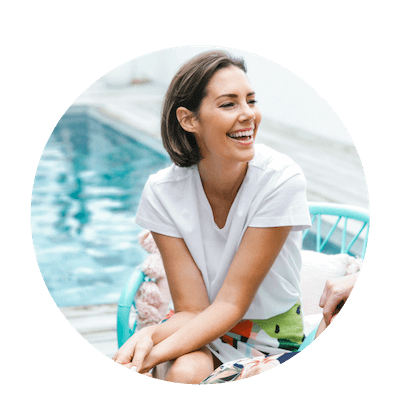 Gentle living has looked differently over the years…from being Australia’s first eco-model working exclusively with eco-friendly and ethical brands, to building a vegan business with her partner David Rafter and living off the grid in a shipping container for a year. For the past 7 years she has built a business empowering teens and training adults to build their own business and programs in their community through her award-winning global course, the Youth Mentor Training. 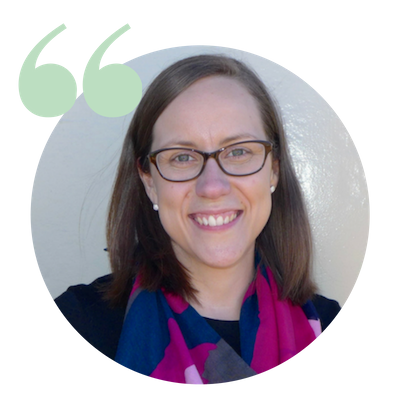 Amanda has a Bachelor of Business Management, life coaching and youth-related qualifications and is a business/marketing course junkie! She’s been featured on the cover of Peppermint Magazine, been mentioned as a ‘game changer’ in The Collective magazine, appeared on The Today Show and is on the Australian Board of Fashion Revolution. She is also the host of The Youth Mentor Podcast. 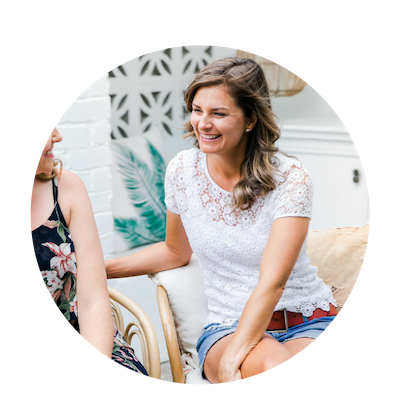 Naomi Arnold is an award-winning life + business coach, entrepreneur, writer, speaker and researcher with a background in psychology, health and human rights. She helps kind and socially conscious people bring to life the dreams they hold for themselves, their loved ones and the world at large. Nicola Newman is a professional artist, writer, painting teacher and retreat host. 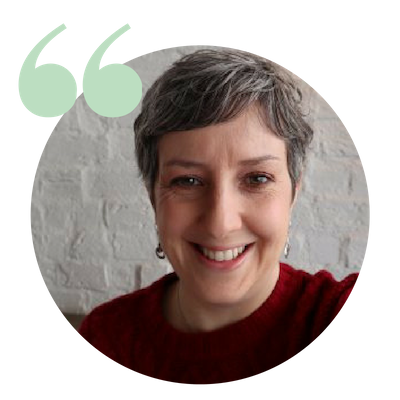 Through her online training program, Flourish with Painting & Creativity, Nicola has helped creative-hearts around the globe express their creativity and explore the world with curiosity and playfulness. Nicola has held over 17 solo exhibitions, been commissioned by Lendlease, Mirvac and The Star, produced a series of documentaries on contemporary Australian artists, created three online programs and is currently filming a YouTube series “Sailing Day Dream,” focused on life aboard her 35 foot sailing yacht. Simple living has allowed her to cultivate her creativity. In her twenties, she bought a small acreage to grow organic food to heal her gut health, and later spent many months traveling the country in a van. Recently she and her husband Andrew sold everything, bought a sail boat and now live aboard as they cruise the east coast of Australia. Nicola shapes her life in accordance with her heart’s desires. She finds fulfilment and income are a by-product of expressing her creativity through paintings, videos, ebooks, workshops, painting retreats and online courses. 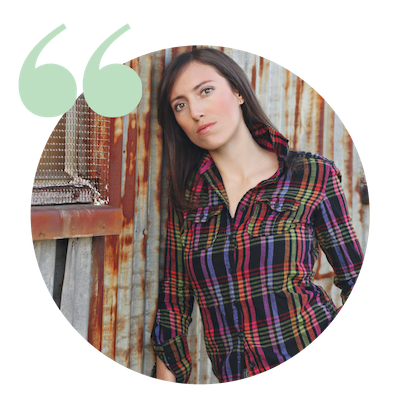 She began working for herself in 2002 and has since followed her heart to cultivate a creative, unconventional life. As a painting teacher and retreat host, Nicola guides students to nurture their creativity, tune into their authentic heart’s desires, gently dissolve creative blocks, and use presence to enjoy the journey as well as the destination. “In a loud and overwhelming online world the GBM community is a lakeside retreat. You’ll come away from mentor calls feeling grounded, connected and with greater insight into what steps you need to take each day and each month. BEFORE THE MASTERMIND I was chasing after all the latest shiny objects with no clear goal of where I wanted to go or how to get there. “Thank you for setting up and running such a wonderfully supportive community of like-minded people who are all trying to do life and business a bit more gently in whatever way that looks like to them. The learning and inspiration I have got from the mastermind, along with the support and sense of community have been helpful, encouraging and nourishing and have helped to give me more confidence in my own voice and business and my own unique way of doing things. 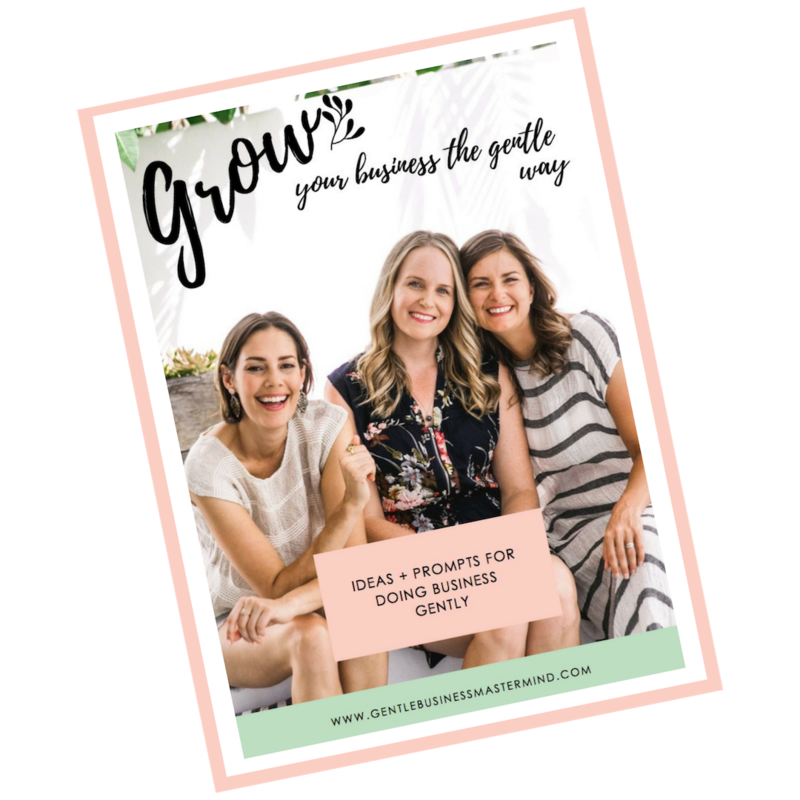 “BEFORE THE GENTLE BUSINESS MASTERMIND I was confused on what actions to take, and didn’t have a community of entrepreneurs I could check in with regularly. I couldn’t afford to hire a business coach for 1:1 sessions. “It’s really cemented my belief in just listening to what I want to do and what works for me. When I left my teaching career to start an online business I had this plan… and it didn’t go to plan! But I fell into the digital production space which has evolved over the year into something bigger than me – that’s come from learning to trust myself and allow myself to do business the way I want.